Fans of “The Simpsons” and “Futurama” will likely be drawn to Netflix’s “Disenchantment” because of the involvement of its creator, the legendary Matt Groening, but it’s actually the voice talent behind this reasonably funny program that elevates the sometimes inconsistent writing. The trio that leads the show—Abbi Jacobson, Eric Andre, and Nat Faxon—are consistently brilliant, and the supporting cast is made up of voice talent all-stars, including John DiMaggio (Bender on “Futurama” & Jake on “Adventure Time,” among a hundred others), Billy West (Fry on “Futurama”, Ren AND Stimpy), Maurice LaMarche (The Brain on “Pinky & the Brain” and literally 348 more credits), Tress MacNeille (Dot on “Animaniacs” and dozens of supporting characters on “The Simpsons”), and more. I emphasize this from the beginning because “Disenchantment” gets off to a rocky start. The series premiere is the least funny episode, too reliant on setting up its characters and its world. Be patient. Once those are in place, and the writers and talent are allowed to have some fun, it works much better, and it’s the kind of show that gets more enjoyable as it goes along, revealing character through repeated jokes and just having more of a good time. Jacobson, the star of “Broad City,” voices a princess named Bean in the medieval kingdom of Dreamland. Bean just wants to live an ordinary life of a young woman, but no one wants to date the daughter of a ruthless king. So she’s developed something of an attitude, and a pretty serious drinking problem. She has only two real friends—an adorable elf named Elfo (Faxon) and a demon in the form of a cat named Luci (Andre). They are the angel and the devil on her shoulder, sending her on adventures every week into a fantasy land of creatures and magic. A typical plotline involves Bean’s dad and stepmom going out of town, so she throws a party … that’s overthrown by Vikings. Overall, “Disenchantment” transplants the general concept of the quarter-life crisis dramedy and puts in an exaggerated fantasy land, in which Groening and his team run wild. Sharing more in common tonally with “Futurama” than “The Simpsons,” “Disenchantment” allows Groening and his team an incredible array of characters and settings in which to play. Most of the plots involve something trying to eat Bean and her friends—ogres, swamp monsters, Hansel & Gretel—but it’s all just an excuse for that rapid-paced sense of humor you remember from the story of Fry and his futuristic friends. 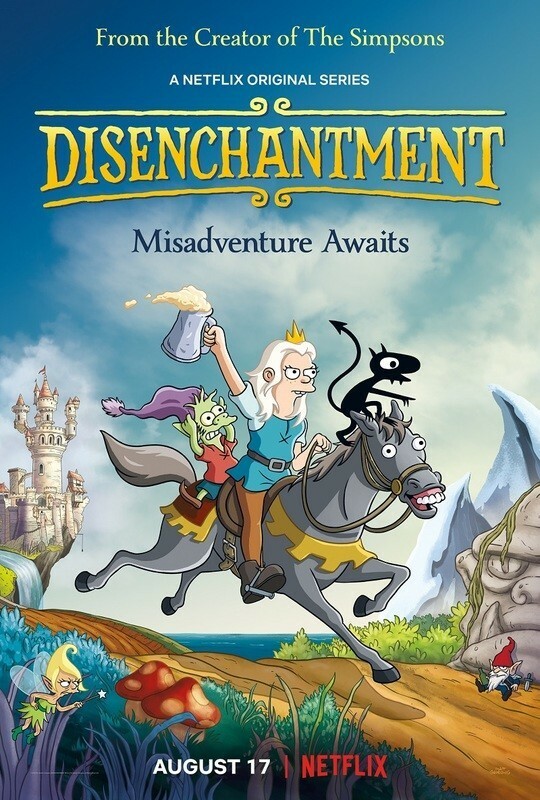 The writing is inconsistent—sometimes surprisingly funny and sometimes surprisingly flat—but I found myself enjoying “Disenchantment” more with each passing episode. As I got further and further away from the clunky set-up in the premiere, I just enjoyed the goofy, old-fashioned sense of humor on display, and the incredible voice work of the people delivering it. Netflix has suddenly become an “adult animation” powerhouse as this leads into the returns of “Bojack Horseman” and “Big Mouth,” two of their best programs. “Disenchantment” isn’t quite on that tier yet, but if it keeps up its rate of improvement with each subsequent episode into another season? It sure will be.